A new release of Praxis LIVE is up at http://code.google.com/p/praxis/ bringing a range of new components and some important improvements. There has been a lot of work on rationalising the audio API’s, meaning amongst other things it’s now possible to create audio plugins for Praxis (same work for video is ongoing). There’s also a range of new audio effects including chorus / flanger and reverb. There’s also some new core components that are particularly useful for working within an audio root, including the basic sequencing possibilities of core:routing:gate and the custom coding potential of core:code:custom. See one of the new examples (07 audio seq) for an overview. Best of all, much of this audio work is designed to work outside of Praxis altogether. The AudioServer API and JACK bindings have been up on the JAudioLibs site for some time, and have been picked up by a few other open-source and commercial projects. The AudioOps API (audio effects) and Pipes are now ready to go up, as soon as I get a chance to write documentation – separate blog post coming. No longer should Windows and OSX users feel left out of the video capture party! The video:capture component now supports a generic device URI that resolves to the correct driver for each platform. OSX support has not been tested as I don’t have access – if you’re interested in helping out with OSX testing please get in touch. Alongside that, there is now a plugin (*.nbm) available for download on the Praxis download page to bundle GStreamer for Windows (32/64 bit). Just use the menu (Tools / Plugins) to open the Plugin manager, switch to the Downloaded tab and install from there. This plugin is based on code from the Processing project by Andres Colubri. It should be easy to adapt to work in any NetBeans based application. 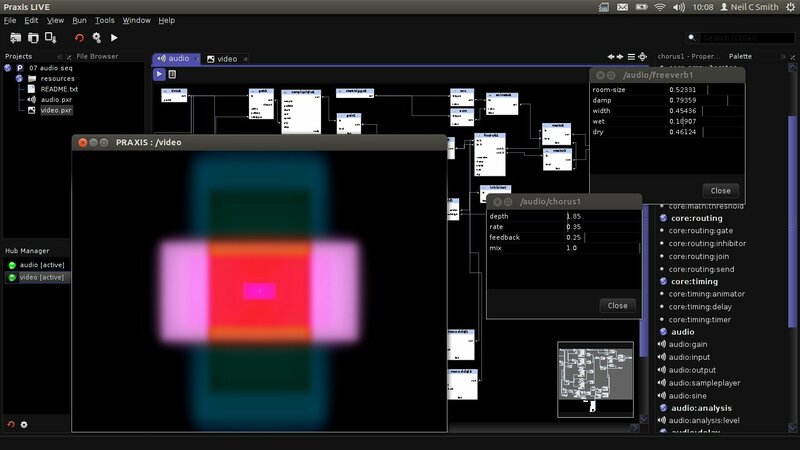 This release brings a new video:opengl:filter component that allows live custom coding of GLSL effects. This requires use of the OpenGL pipeline (obviously! 🙂 ) Switch it on in Tools / Options / Video. Example 09 GLSL shows this in use, though requires a working webcam – should be easy to adapt to use other video sources. No syntax highlighting of GLSL, yet. All components now have help files. Work is ongoing to get a first-draft manual completed, as well as a wiki page documenting the coding API (not all of the Processing API is supported and there are some key additions, so it would be good to get this up). As Geertjan recently suggested to me, some video demos and tutorials would also be good – they’re on the @TODO list. As always, full release notes are available. This entry was posted in NetBeans, Praxis and tagged NetBeans, open source, software, technology by Neil C Smith. Bookmark the permalink.